It's fitting that, as Halloween originated in Ireland, we lead the way with fun things to do over the holiday season. What started as the Celtic festival Samhain is now a month-long celebration featuring pumpkin patches, parties, pranks and poltergeists! The site has thousands of ideas but we've narrowed the list down to some of our Halloween favourites...only if you're brave enough! The Ark Playcentre at Puddenhill is under new management and they are planning some spectacular Halloween parties this year. Each party is three-hours long and will include the fun indoor soft play area, outdoor playground and animal farm at the play centre. There will also be a few spooks along the way, face painting, disco and every child will get a pumpkin to take home! Halloween events are for big kids too and the Zip of Terror is only for the really brave ones! Do you think you are brave enough to zip through the night sky before wandering through a forest full of frights? This event takes about 90 minutes, is for over 12s and you can get a 15% discount. During the Halloween Experience, you can play in the spooky barn, visit the witches' den and have fun in the hay maze. There will also be a ghost carriage, the blue barrel express and horse and carriage rides available for extra. All the family are invited to dress in their scariest Hallowe’en outfit for an afternoon of Ghoulish Arts & Crafts, Spooky Storytelling, Hunting for The Púca, Witchery in the Roundhouse and the grand finale, everybody’s favourite - the Bonfire to celebrate Samhain. Wains World in Buncrana is hosting a fun-filled Halloween party with face painting, treats, juice and full use of the indoor play frame. A fantastic, fun-filled day out with the Haunted house, spooky walks, story-telling, reptile room and more! Junction 6 is a new Health and Leisure village just off the M50 and home to a new children's play centre, Ship Shape Kids Play. During the mid-term break, they are offering entry for only €6 for each child plus a free tea/coffee for the grown-ups. Playtown Tullamore is a family run imagination based miniature town play centre with twenty-one play themes for children. On Bank Holiday Monday, they will be hosting a special party featuring spooky town, scary music and a horror hunt with prizes for the best fancy dress. Are you ready to scare yourself silly this Halloween?! Westport House will be hosting it’s annual Halloween Fest with plenty of ghoulish delights, scary stories and creepy fun that all the family will be able to enjoy! Head to the Haunted Estate House, gather ‘round the cauldron for scary story time, visit the dark dungeons where the Pirate Queen Grace O’Malley locked up her prisoners, carve a creepy pumpkin, decorate some ghoulish goblin cakes and more. A safe family Halloween event with a spectacular firework display in three Dublin venues. Arrive in your fancy dress (bring a torch) and enjoy the live entertainment before the main event. Supervised play time with scary arts & crafts, themed bowling, games in The Congo Quest, best-dressed prizes, spooky face painting & lots more. Choose and carve your very own Pumpkin lantern, enjoy traditional Halloween games, face painting and harvest your pumpkins seeds to grow your own pumpkin. Cast and paint your very own Halloween monster this mid-term. You can choose from a witch, pumpkin, cat, ghost, Frankenstein, vampire, werewolf or pirate skull. Make them, paint them and take them home...if you dare! 29) Costumes & Pumpkins & Candy Oh My!!! For the past few years, Ken Carraher has built a Halloween crypt in his garden in Killiney and has raised almost €30,000 for Debra Ireland. The crypt is open for Halloween again this year and donations are welcome. Halloween family fun returns to the maze this year with a Halloween Hunt. Other activities are also available including a wooden maze, crazy golf, zip wire and more. No bookings, standard admission. Halloween is a special time of year at Causey Farm. Ghouls, goblins, and ghostly goings-on are just waiting to send a silly shiver down your spine at Pooka Spooka. Enjoy Birds of Prey display, traditional games and crafts, scarecrow corn maze, mirror maze, hayride, broomstick ride, story-telling and more. The Macnas Halloween Parade in Galway is the largest free event in In Ireland for Halloween with over 54,000 people lining the streets every year to be awed and amazed by this epic scale of storytelling. This year's story celebrates the act of transformation being unleashed upon the city. A world that is hypnotic and intoxicating, glittering, mysterious and filled with shadowy and noble things. Over the mid-term, Wicklow's Historic Gaol are running two special tours. First, a Spooky Fancy Dress tour on 29th & 30th followed by a Spider Hunt on Halloween. Are you brave enough to search the corridors and halls of Wicklow Gaol for spiders? Meet the Medieval Dublin chancer, Bran the grave-digger, who has the gruesome job of hauling poor souls to the local graveyard and find out all about the strange tale of Drunken Thomas’s encounter in St. Michael’s graveyard, and just how much he managed to upset the dead at Halloween!! There are so many things to do this Halloween! Whether you’re a Horror movie fanatic or a Halloween junkie, love to be petrified or just enjoy the detail of a highly interactive one-of-a-kind experience, Haunted Spooktacular has something for everybody. Sligo Folk Park hosts a fun trick or treat trail this Halloween with lots of fun for children from 3 - 8 years old. The annual Scare in the Park is on Halloween night 31st October from 5 to 8pm. Both events are €5 per child and children must be accompanied by an adult at all times. Captain Jack & Aye Aye Izzy are back at it again with their Spooky Halloween camp featuring arts & crafts, pumpkin carving, pirate treasure hunt, adventure golf, paddle boats, go-karts and more. Halloween at Moher Hill Open Farm is the time of year when the witches and ghouls come out to scare. There will be a special children's magic show featuring ‘Pegani’ The Great Magician, play traditional Halloween fun and games, face painting, bouncing castle, go karts, ball pool and more. If ghosts and ghouls aren’t your thing, bring the family to Killruddery for a weekend of bright and seasonal fun! Go to the pumpkin patch in the Walled Garden and choose a pumpkin of your own with help from our farmer. Then you can design it and have it carved out by a master craftsman! On Friday, October 26th, Victorian Tea Times will be hosting an evening of spine-tingling storytelling whereby guests can follow Death and his story of The Three Brothers while dining on tasty treats in a spooky ambience. Tickets are €45 each. A guided spooktacular family cycle where you can listen to tales of the unexpected, children can answer the question hunt and crack the code and you can collect items for the witches cauldron. The Presentation Arts Centre is a new multi-use arts venue in Enniscorthy, Co.Wexford, situated on the site of the former Presentation Convent. 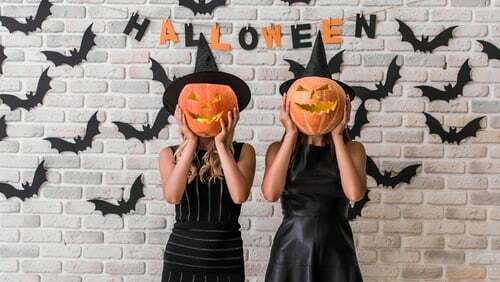 Over Halloween, they will host a number of fun events including Jackula, pumpkin carving workshop, face painting and a movie screening of Casper. YourDaysOut is a sales and marketing platform for local businesses and event organisers with tools to help promote, publish and sell tickets online, for less. It is also the No.1 site for people looking for things to do, where users can also FOLLOW their favourite pages to get notifications about any offers and events and buy tickets for Halloween or Christmas or discount deals.